Solar cycles are really 22 years (or so) because each 11 year alternate cycle alternates with the North pole “on top” then the South pole. Complexifying things, there are scientists who think phytoplankton changes CO2 levels (more on that soon), and others who think microbial sea life can affect cloud seeding. Fourth amazing thing is a marine researcher willing to say they need data to support their models and that the man-made signal was not statistically significant. Bravo to Kylie Pitt from Griffith University. And well done Malcolm Sutton, ABC, Adelaide. Master of Jellyfish? 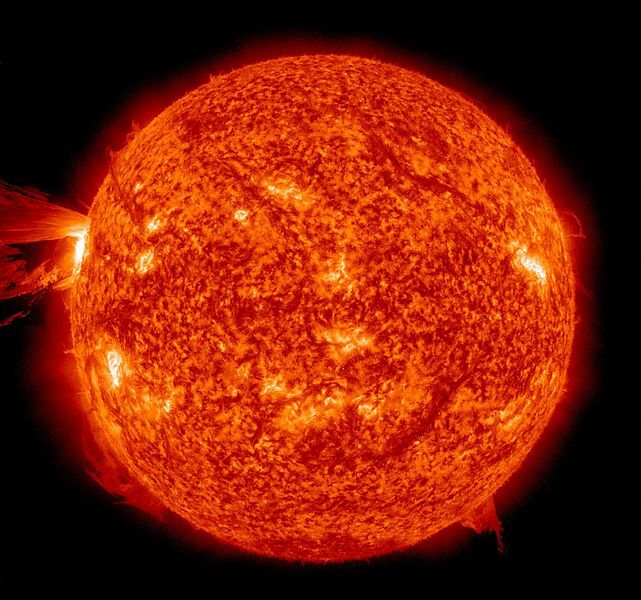 Image: NASA, GSFC, SDO. Ah, some real science at last. Maybe some other university could learn about real actual fact based research and apply it to the GBR although that would mean they would have to fire most of their brainwashed researchers and those in oversight. This could be the start of the push back to all the stupid science of global warming always assuming it will be allowed to be published. So the ocean temperature is controlled by solar activity, the only source of radiant heat on the planet? So unlikely. I thought 97% of scientists were convinced all surface temperatures were controlled by CO2 and only by CO2? Why then are we blowing up our working coal power plants? Next there will be a mad theory that the Green parties are a front for anti semitic communists and fascists (National Socialists) aligned with German and French plutocrats trying to take over democratic Western governments. Just like last time. Or is that hate speech? The modern fascist is a right wing communist. Sounds pretty accurate to me . A 22 year cycle? Sounds like a job for life. Then, how do you measure jellyfish numbers. Do you give every commercial fisherman and surf lifesaver a monitoring job to observe and sample. Surely there are other things that are more important, like the social and political chaos of civilization that lead youth to give up and despair? What about researching a functional electricity generation system and a royal commission into the CO2 driven global warming scam. I’d rather have a blue bottle tail wrapped around my leg than face the daily evidence that we are being enslaved by modern politics. In Auckland, you know when there’s a jellyfish over supply: everybody, adults and kids are scrambling out of the water at the beaches covered in welts and nobody is prepared to re-enter the tide. It doesn’t matter how hot it gets, no-one is prepared to go back in!! There you are KK: jellyfish numbers are inversely proportional to the swimmers at a beach. It’s not a smooth relationship but all or nothing! But…but man generated CO2 was all they could think of as the cause. After all, blaming bad weather on Witches is so 1600. Maybe, just maybe, it is simply a lack of imagination, malice, or malevolence. Perhaps it a preconceived notion to be use to generate fear, uncertainty, and doubt. All to be used to extract wealth from those who create it and to be given to those who do not and cannot create it. Which was the primary method used by governments since the first government. It is NOT Progressive, it is regression to an ancient past. Lionell: I don’t think it’s so much a lack of imagination etc. I think it’s more like a lack of access to proper information. The Gullibles believe that cry of the ignorant believers: the Science is settled. If it’s settled, then the MSM censorship of everything which will disprove the Climate Change propaganda, is successful. Many of the scientific papers thoroughly proving the provenance of the Sun, that it’s not CO2 nor mankind’s emissions, are just not published—it’s `Officially’ all Denier stuff so they, the Gullibles, just don’t know the true state of up-to-date science. The MSM restricts itself, in the face of exciting science, to derogatory/disparaging articles such as this one. The author is an astronomer himself and his writing is is also “ a giant failure of science communication‘ Shame on him. Science and so-called universal education may be thought to have evicted witches from our beliefs but our beliefs have clung onto them. Most of our tropospheric weather including and especially the so-called extreme weather (tropical Cyclones in all their varieties, heavy precipitation (rain, hail and snow), is caused/driven by the Solar Wind. But the credulous, the Gullibles, those who still cling to their need for witchcraft, are still blaming CO2 and `human emissions.’ Obviously, they are completely unaware of the recent science, either accidently or deliberately. The Solar Wind has well documented effects on both human health (heart attacks and strokes) and deep earthquakes along tectonic boundaries (see http://www.quakewatch.com) Its effects on even on human longevity are being measured now, yet the MSM has mentioned nothing of this. As the sun declines into a Grand Solar Minimum, so too does its magnetic field decline and the GCRs (Galactic Cosmic Rays) striking the top of our atmosphere and creating huge downward sprays of secondary cosmic rays (energetic particles from smashed atomic nucleae of atmospheric molecules) increase. They are now at their highest since the start of the space age. Some of these particles are high velocity and penetrate surprisingly deeply into the ground. You may have noticed an uptick in volcanism over the last few years and the new and `improved’ rumblings and rattlings from some of the world’s super volcanoes such as Long Valley and Yellowstone in the USA, Campi Flegrei in Naples, Etna in Sicily and now Santorine (Thera, Aegean Sea). It is thought to be the heating of the magma in the magma chambers by these Cosmic Ray Cascades which triggers eruptions. So the sun has some control over volcanoes. (NB: None, one of more of the aformentioned SVs could erupt.) Anak Krakatau blew its Island to pieces just before the end of last year. Before the previous Grand Minimum, the seventeenth century Little Ice Age, there was a similar uptick in volcanic activity. In fact some think it was the volcanic activity which triggered the cold rather than the suns’ activity which triggered both. The sixteenth and seventeenth century Witchhunts are not an ancient past by any means—they are too recent and scary! Because the wealth of the Witches was confiscated by the governements(prosecuters and jailers), church and the witch-hunters of the time, most witches were from the middle classes. There was no point accusing a poor person: there was no wealth to confiscate. Such confiscation is exactly the same as a tax (or a tax is the same as confiscation). Sounds just like Carbon Taxes! It’s more severe because the `tax-payer’ back then also lost their life (but look at the entertainment value of the public executions!) In this modern iteration we stand to lose our democracies and through that our freedoms. Carbon Taxes will, however Save the World. Jo, typo second sentence ‘jellyfish plaques plagues’. Correctly spelled in the final sentence. Maybe you should vote some jellyfish into office. They appear to be more intelligent than far too many of the politicians in the world. All the jellyfish can do is litter your beaches with drying puddles of jelly, some of which can still sting. In a few days, they are gone. Politicians, on the other hand, consume what they don’t produce and take more when they run out. Your continued existence and well being is not their concern. You can survive not going to the beach but you can’t survive if your hard earned wealth you have produced is taken from you and making more is made increasingly harder to accomplish. Gee, politician’s behaviour and attitudes are so often described as being akin if not actually related to those marine animals. How often are the complaints about needing to `grow a spine’ and another being totally `spineless’ made? Now we find out they, the pollies, are no relatives at all of jelly fish—at all, at all at all. 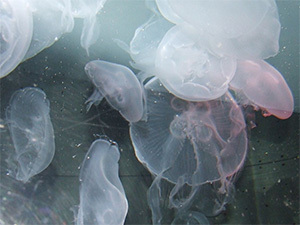 Or is it that the jellyfish are not relatives of the politicians? Thanks Lionell: your suggestion has merit, but I have this feeling that, apart from the odour decaying jellyfish emit, not many voters will appreciate it, let alone actually notice. I bet the jellyfish haven’t accepted any of the UN/IPCC, or whatever, propaganda at all ever! If they had, they wouldn’t be so successful still! Turns out emitting a trace gas (CO2) is a truly lousy way of boiling the oceans, turning them acidic, and wiping out species, in this case, jelly fish. Huugh? Obviously the person who wrote this has never observed tropical stingers. (Not an easy task but can be done.) Stingers don’t really have much capacity to “push” in any direction. Just about capable of trim and elevation corrections, and that’s about all. They go with the currents, so may go south due to the EAC, but the currents are way more complex than what is shown on the CSIRO/BoM websites. Up here in NQ they appear to move UP from the south, but that is because of the localised longshore drift. The East Australian Current turns left after reaching Sydney and heads off to New Zealand. … and don’t we know it! . Weather patterns such as wash, rinse, blow dry, and repeat all follow along! As a kid, around 1964, I visited a beach in mainland Greece. There had been a storm. The beach was covered in large jelly fish to a depth of 30cm. I am talking about millions of these large creatures per acre. It was an amazing sight. I am sure if that happened today, they would make headlines of it. Blocking Highs and sea surface temperatures. ‘Masses of bluebottles have been turning up on southern Queensland beaches over the last week with thousands of people being stung. Further south, upwelled water has been cooling beach temperatures along the northern and central NSW coast and in the Tasman Sea the water is warming. All of these events can be linked to the presence of a blocking high over the Tasman. As carbon dioxide increases crop yields of all kinds, perhaps we can offset the surplus of jellyfish with more peanut butter. Thought this was referring to “climate scientists” at first. See this Tasman Weather Sea map. Two days ago, the anticyclone covering the Tasman was only 1016hpa. Yesterday it had intensified to 1022 hpa. But it’s crawling, obviously got nowhere to go. The collapse of the subtropical ridge is a regional cooling signal.